I've been trying really hard to find a reason to fear this team. I don't mean to sound like an arrogant prick, but I can't find one. Not one. In their last three games, the Patriots have beat them 59-24, 43-22 and 42–20. I did the math. The Patriots have won by an average of 26 points. I don't understand how a team that hasn't made any fundamental changes is going to magically flip the switch. 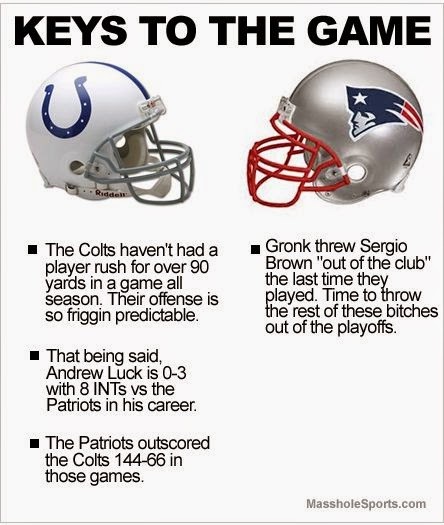 My official prediction: Patriots 62 Colts 21.